At a recent in-service, we were asked to think about why we do what we do. We watched a video that illustrated the reasons we should remember this important lesson. It’s wonderful when I am reminded why I am a teacher. In the fall, I dropped my middle child off at Oregon State University where she would start as a freshman. We were at the Bed Bath & Beyond in Corvallis, Oregon shopping for items she would need for her dorm room. As I pushed my shopping cart down the aisle, I heard a woman say, “Excuse me, are you Mrs. Kozak?” I looked at her strangely because I was surprised someone recognized me in Corvallis, Oregon. It turns out that I was her son’s teacher in 2nd grade. They moved to a different town the following year, so I lost touch with the family. She went on to tell me how much they loved being in my class. It was amazing to hear what became of him. He is a freshman at OSU and lives in the same dorm as my daughter. Here is a picture of Noah and me at the Bed Bath & Beyond. Last weekend, I attended the Women’s March and ran into another former student, Madison, and her mother. They recognized me all these years later. Madison just graduated from Sonoma State University and got a job at a marketing firm. Her mother said she always remembers me when she hears the song, “Blackbird”, by the Beatles. I taught that song to my students in 2nd grade. We would always start our day with songs and poems. It was an awesome way to start our day on a positive note. No matter what happened to students before school started, there was always a fun song and poetry recitations to look forward to. Here is a picture of Madison, her mom, and me at the Women’s March. Yesterday, I had a doctor’s appointment after work. I was checking in with the receptionist while writing my name on a clipboard. I wasn’t paying full attention to the person behind the desk. The receptionist, Marie, asked for my insurance card, and I took a seat in the waiting room. When she came out with my card, she said, “I just have to mention this to you. You probably don’t recognize me, but you used to be my daughter’s teacher.” I looked at her more closely because I wanted to remember who she was. I asked her the name of her daughter and she said it was Maddy. I thought, “Oh brother. I have had so many Maddys in my teaching career.” She told me that Maddy was in my class in 2nd grade and then they moved to another school in the district. As she relayed the story to me, I gradually began to remember who her daughter was. Marie went on to tell me that I had made a big impact on her daughter, and she always remembered my class. Maddy, especially, loved when we sang in the morning. She went to high school and sang in the school choir. She is now going to Northern Arizona University and wants to be a teacher. Her mom said I had a lot to do with that. I was very touched by everything she said. Sadly, I did not get a picture of Maddy or Marie to share with all of you. I’m happy when I run into former students, even though it reminds me of how old (and how short) I am getting! These reunions help me remember my why. On days when I am feeling frustrated not knowing if I am making a difference in my students’ lives, I think about Noah, and Madison, and Maddy, and know that I am. Even though I am not seeing the immediate effects at this moment, I know that I may be saying or doing something to influence them later. When I am trapped in the mundane, I need to remember to try and find the joy in what I am doing. It might not seem like I am getting anywhere with students, but I have to believe I am making an impact that might not be felt until years later. That thought helps me keep on teaching! Recently, an Asian friend of mine texted me the story about how her daughter shared on social media that she wouldn’t be here except for immigration. A white supremecist trolled her and told her to go back to where she came from. The thing is my friend’s daughter was born in the United States. She is from America. I replied to my friend that I hoped her daughter told her immigration story. She didn’t, and that got me thinking about my own immigration story. Just like my friend’s daughter, I was born in the United States. Portsmouth, Virginia to be exact. My parents are Filipino and immigrated to this country. Both my parents earned Bachelor’s Degrees in the Philippines. My dad graduated from Far Eastern University. My mom graduated from Rizal College. Their path to the United States happened because my father enlisted in the U.S. Navy with the promise of U.S. citizenship for his service. Before my father left the Philippines, he married my mom and after a few months, she was able to join him in Norfolk, Virginia. Shortly after she arrived in Virginia, I was born. Eventually, my dad was granted citizenship. In 1975, after long hours of studying, my mom became an American citizen. My parents worked hard to make a better life for our family in this country. My father worked his way up from the enlisted ranks to a Chief Petty Officer in the Navy. When he retired, he worked for the Public Works Administration. He left that job to work for the United States Postal Service where he eventually retired again. My mother, who was a teacher in the Philippines, worked as an accountant when we moved to Mississippi (Dad got stationed there from Virginia). When we moved to San Diego, mom got a job at Kyocera putting together microchips on an assembly line. Concurrently, she went back to college to obtain a California teaching credential and a master’s degree in multicultural education. To this day, I marvel at my parents’ work ethic. All the while, they explained to my siblings and me the importance of a good education. We were told to go to college so we could get a good job. When we finally got to college, they told us to focus on school. They discouraged us from getting jobs because it would distract us from our schoolwork. They paid for 3 kids to go to college without taking out any loans. That’s why it kills me when I hear generalizations like, “Immigrants are lazy.” My parents definitely did not fall into this category. When I was in elementary school, my sister and I were walking home when three older boys, who happened to be white, began following us. All the while, they were shouting ethnic slurs at us. I don’t remember exactly all the words they used, but two stood out-chink and gook-because I didn’t know what they meant. At first, my sister and I walked in silence, but after a few minutes of their yelling, I began to get angry. My sister pleaded with me to just remain silent and keep walking, but I couldn’t. One of the boys called out, “Hey you stinking Japs! Why don’t you just go back home where you came from?” At this point I wanted to turn around and hit that boy with my metal Scooby Doo lunchbox. Like a volcano building up pressure, I finally blew my top. I turned around and shouted at them, “That just shows how stupid you guys are. We are Filipino, you idiot. NOT Japanese!” The boys just laughed and crossed the street. Later, I thought about that question. Even though I was Filipino, America is where I came from. Today, I am a contributing member to society, and I am raising my children to be decent citizens in this awesome nation. Don’t get me wrong. I value my Filipino heritage, but I identify with American culture. I am American. I am Filipino. I cannot separate the two. What I do know is this. I agree with my friend’s daughter. If it wasn’t for immigration I would not be here either. And for that fact, I am proud to say that I am the daughter of amazing immigrants. Happy New Year! It’s been a long time since I have written anything on my blog, but I am inspired to post my 2018 Word of the Year after reading @kd0602 blog post Thinking Through My Lens. Kim wrote about her word of the year, and I just happened to read it. I replied to her on Twitter, and told her what my #onelittleword for 2018 was. She responded back to me and asked if I posted my word on my blog. Of course, I had not. But, I was seriously thinking about it before she asked. So, here I am posting my story with a little encouragement from Kim. Thanks, Kim! Since 2014, I have resolved not to make any New Year’s Resolutions. I always start out strong, and then somehow my resolve fizzes out. Instead, I decided to think of one word that would be my mantra for the year. In 2014, my word was love. In 2015, my word was yet. In 2016, my word was breathe. In 2017, it was gratitude. The words helped focus me throughout the year, and I tried to find ways to connect to the words in some way in my daily routines. During the last week of 2017, I actually made a list of words that I thought I might want to be my mantra for the new year. I decided that my new word for 2018 would be BALANCE. I have been reflecting a lot about my #onelittleword and have realized that this word has been important throughout my life. 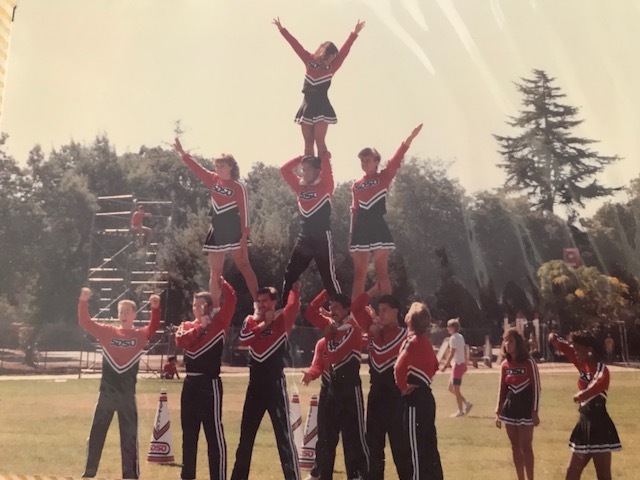 In high school I was part of the gymnastics team and competed in all-around events. The most chanllenging event for me was the balance beam. It took a lot of focus to stay on this apparatus and I’m amazed how I managed to stay on a 4 inch wide beam that is about 4 feet off the ground! In college, balance took on a new meaning. 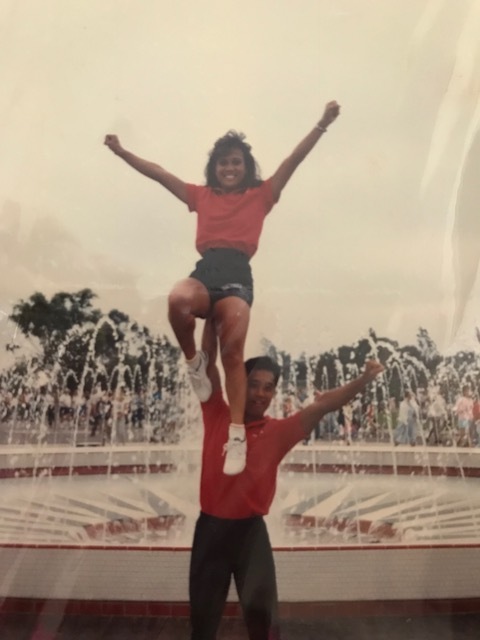 I was a member of the San Diego State University Cheerleading Squad. I needed to have a good sense of balance to complete the partner stunts and pyramids that we built. For some reason, I always found myself at the top. Now that I am older, the word balance is still important to me but in a different way. I find myself juggling all the roles I have: wife, mom, teacher. It’s important for me to have balance in life. Somewhere I have to make sure I find time for myself. Just like I would have to center myself to stay on the balance beam or on top of the pyramid, I need to remember to be centered in my daily life. In addition, I have to give myself permission to have a little “me” time. It will keep me sane in 2018! I find myself having a lot of these moments nowadays. Since it’s my first year teaching 6th grade English Language Arts, I have been planning lessons with activities I am not sure will be a success. I mean, the lessons go wonderfully in my mind. But, you never know unless you try. The week before we were to return to school after the winter break, I wondered what I would do with my students on the first day back. I knew I wanted to do a writing genre study on memoirs. 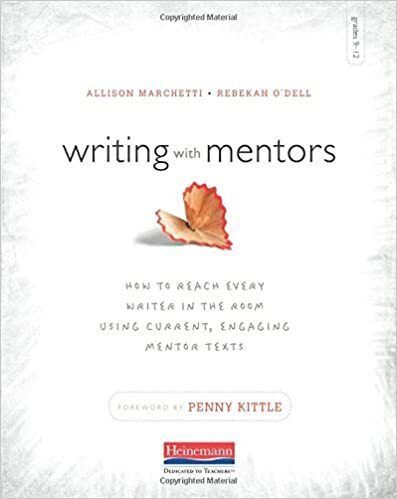 I had been inspired after reading the book, Writing With Mentors: How To Reach Every Writer in the Room Using Current, Engaging Mentor Texts, by Allison Marchetti and Rebekah O’Dell. I also knew that I wanted to engage my students in a way that would motivate them to learn. I didn’t want to come back to school after the break and fall into the same routine. . . read the story and answer the questions. Another goal I had was to utilize the technology being stored in the back of my room. 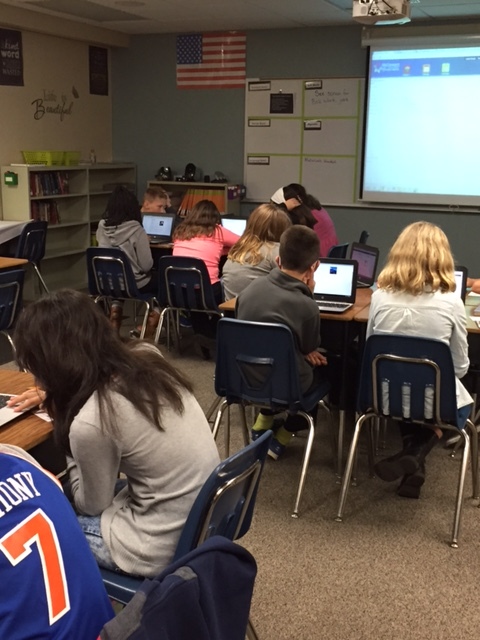 I have access to a Chromebook cart, and I volunteered to keep it in my room to be shared among the other 6th grade language arts teachers. The cart sits back there untouched. The Chromebooks are locked up like inmates in a high security prison. Someone needed to break them out. I resolve to incorporate them into my lesson at least 2-3 times a week. We have only been in school for 3 days, but I feel energized and excited about teaching. Already I have found myself making statements like, “We are going to give this a try and see how it works.” I am trying to encourage a growth mindset in my students, so I feel it’s important for them to hear me say those words and to let them know when something didn’t work. (Click here to read a past post of mine for more information about growth mindset.) Sometimes I announce, “Growth mindset moment!” I also tell them that I have a plan for next time. Several times I feel like I have failed miserably and I think to myself, “Well, that didn’t work.” However, that’s the beauty of teaching 5 periods. By the time my last period rolls around, I have been reflecting, refining, and tweaking the lesson. It has been a long time since I have posted anything to my blog. I have been meaning to get back to writing, and I have a million and one excuses for why I took a break. But, as one of my favorite celebrities, Cesar Millan (aka the Dog Whisperer), says, “Don’t try, just do.” I figured the eve of my 50th birthday was as good a time as any to try and get back into the blogosphere. Yes, you heard me right. It’s the night before my 50th birthday. I was having a conversation with a student today. Somehow she heard my birthday was tomorrow. She asked me if I was excited, and of course I told her I was. However, I am not excited about birthdays in the same way I was in my teens. I remember looking forward to the day when I would be another year older. I would even count the days until my birthday would arrive. I realize as I get older, I don’t anticipate as much. Instead, I look back at the year and review. And when I hit a milestone birthday, like 50, I tend to look back and review the whole decade. Am I the only one who does this? God, I hope not. As I reflect back on my 40s, I realize that I have accomplished and achieved many of the goals I set for myself personally and professionally. The 40s were awesome. I can honestly say I am comfortable in my own skin. I am not as concerned about what other people think of me. My confidence level has increased compared to my 20s or even 30s. These days I am all about enjoying myself and trying not to worry so much. Be happy and celebrate life. These are the things I would tell my younger self if my present self wrote a letter. In an effort to celebrate the end of my 40s, my friend (and neighbor), Nicole, gave me the idea that I should do something special for myself every month on the 19th. She told me this 6 months before my 50th birthday. So, every month, I gave myself a treat. Here is a collage of the things I did for myself to celebrate me. I documented it on Instagram. All of this leading up to tomorrow. I know now that reaching 50, and everyday beyond that, is a gift. I will not take anything for granted. I will appreciate all the little things and be thankful for all the big things that happen in my life. I will not forget to say, “I love you” to the people that matter most to me. I will remember to be kind to myself. If I can do all these things, my 50s will be spectacular! It’s been over one year since I started my blog. In fact, I published my first post on 8/8/13. I realize I haven’t posted anything lately. I just haven’t found a topic I thought was interesting enough. After school got out in June, I was busy packing up my classroom and moving into my new office space at a different school. I wanted to be all moved in before I left for my vacation in July. After my vacation, I went back to school. It’s been busy. Basically, after returning from my vacation in Hawaii, it was back to work. Last week, I attended the last two days of a math institute given by my school district. Math leaders from all over the district met over two days to plan the district-wide professional growth day which would focus on math practices. I would have to present two sessions. One was on math discourse and the other was a polygon investigation. I was able to remain calm while others around me expressed their anxiety. I think it had to do with having presented to a large audience last spring for the SDAWP Spring Conference. I was not nervous at all, except for right before I was to present. During the institute, one of the consultants shared a video about power posing. All it takes is two minutes of power posing to raise your confidence and lower your stress. Who knew?? Amy Cuddy talked about not belonging. Boy, can I relate to this feeling. 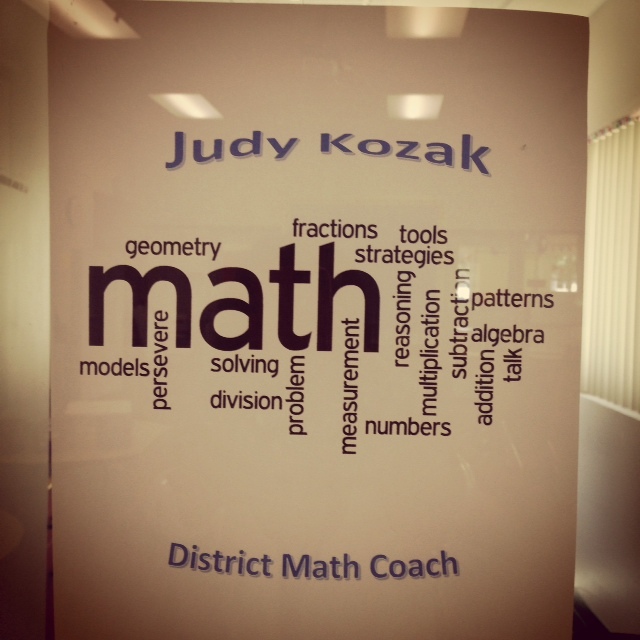 I started my job as a district math coach this week. I spent most of my time at my mentor site which just happens to be the largest elementary school in the district. My first order of business is to build relationships with the people on staff. It’s been difficult, and I find myself missing the people I had connections with at my previous school site. I am thinking this is pretty normal. I felt odd not prepping for the first day of school, which is tomorrow. It ‘s the first time in 25 years where I wasn’t getting ready for students. I felt like I needed to be doing something, a task of some sort. Instead, I organized my office space. I prepared for my next staff presentation by doing research in the many resource books I received. I don’t know why I felt guilty. Everyone in my building was “working”. I was working, too, but in a different way. It was strange. I managed to take a picture of my office and the sign I created which I hung on the door. I am excited. I know I made the right choice in applying for this job. All I have to remember is to stay positive and do my power poses. Ahh, it’s good to be back home again. My family and I spent ten wonderful days in Hawaii for a family vacation. It’s amazing how relaxing a vacation can be. We spent a few days at the Hilton Hawaiian Village on the island of Oahu. After that we spent a week in a rental home in the area of Hawaii Kai which is very close to Hanauma Bay. I posted many pictures from my trip on Instagram as a way to document what we were up to. We had a wonderful time, but it is nice to be back home again. In some ways I was sad to leave Hawaii. I realized that leaving would mean I would have to get back to work. I think part of the reason why I loved being in Hawaii was the fact that I didn’t have a schedule. I had no job to report to, and I didn’t have to set my alarm clock to wake me up every morning. Going back home meant leaving paradise and facing reality. I wonder if I would still view Hawaii as paradise if I had to live and work there. One night, as I was enjoying the sunset on the beach of our rental home, I met one of the neighbors. He happened to be walking his dog, and we struck up a conversation. He voiced his opinion about how living in Hawaii was different from vacationing in Hawaii. He commented about how island living could get somewhat boring. I guess if you have seen and done everything the island has to offer, what else is there? I totally understood what he was talking about. I guess that is the allure of traveling. You get to experience all the place you are visiting has to offer. Then, you can come home. 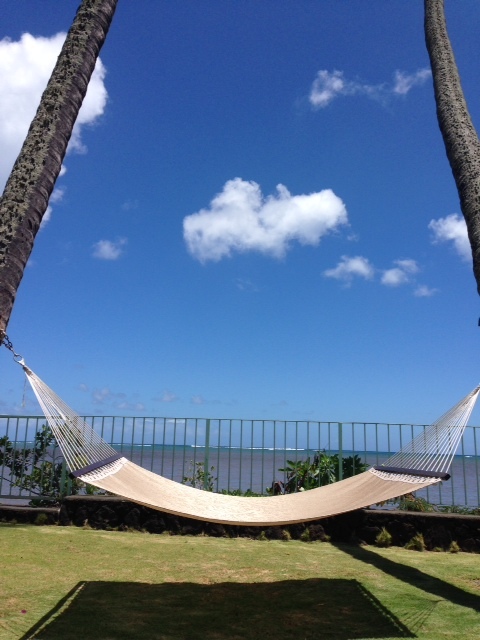 My favorite place on vacation was the hammock in the backyard of the place we rented. It was truly relaxing, and I spent a lot of time on it. It gave me a chance to enjoy where I was. I didn’t think about work once. I truly could appreciate the moment and enjoy. I can’t wait to get back to that hammock. I hope it happens sooner rather than later.